In January a number of years ago my home was burglarized. That Saturday morning it seemed an unlikely event. The sun was shining brightly on my quiet friendly street and I was in a bright mood. I needed to do some errands so left the house midday and when I returned after only about two hours I had been broken into and robbed of all small electronic devices and every bit of jewelry. According to the police, everything that could be taken quickly and carried away easily on foot. For any who have suffered a similar incident, you know it carries a strong sense of personal violation. It takes awhile to get your bearings while dealing with practical issues like filing police reports, changing locks, and submitting insurance claims. But that’s not all. What about the spiritual perspective? Where was God in this? What happened? In my case I almost immediately remembered a dream I had had back in October, just about three months to the day prior to the burglary. I had been warned of this impending event and now I could see that clearly. I knew even at the time that the dream was significant and that’s an important point in interpreting dreams. Here’s the dream. I was in a park on a lovely day. I casually crossed a walkway from a park bench where I had been sitting. Suddenly realizing I had left my purse on the bench I looked back to see that it was gone. It had been stolen and I knew that it was my own fault, careless negligence. Without my purse all the information that I needed to help myself was missing. I felt an overwhelming sense of guilt and stupidity. I mentally kicked myself over and over because of a mess that had been so avoidable. “If only…” played repeatedly in my brain. 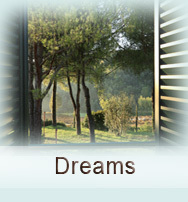 When I awoke the dream was near and very vivid and the feelings associated with it were extremely strong. The strength of emotions is a clue that a dream may be out of the ordinary. Normal dreams usually fade fast. I think about Joseph when he was warned in a dream to take the baby Jesus and Mary to Egypt. (See Matthew 2:12) I feel sure that his dream was accompanied by a very strong sense of danger. Why? Because when he was given the all clear to return home in another dream he didn’t proceed with full confidence. “He heard that Archelaus was reigning over Judea in place of his father Herod, (and) he was afraid to go there.” (Matthew 2:22) So pay attention to strong emotion. Feeling sure that my dream represented a warning of some type I began to analyze vulnerabilities regarding the contents of my purse in particular. Did I have a file with copies of important documents like my driver’s license and credit cards? Did I have the right phone numbers to call in case of theft? Was I being careful enough in restaurants or while shopping? Should I tighten up the overall security of my household? One of the areas that definitely needed tightening was my general carelessness in locking doors. I had grown complacent during a time when I owned a large protective German Shepherd. Really, with him around, there was no need for locks but he had been gone several years. I had never completely reverted back to consistent locking. So I started to lock doors again—but not every single time. You guessed it; my doors weren’t locked the day of the burglary. I gave way to laziness since it was broad daylight and I wasn’t going to be gone long. After all, I lived in such a safe neighborhood where everyone watched out for each other. Plus it had been three whole months since the dream and nothing had come about. When I returned home and realized what had happened I felt exactly like I had in the dream. Like it was all my own fault—completely avoidable. Actually, if I had paid better attention to the dream I’m sure the incident would have been avoided. But then of course I wouldn’t have ever known that it was a true warning dream after all. So I completely blew it, right? What good was the warning since I never heeded it? Not true. Having had the dream did help me in some important ways. After I had it I began special prayer for protection of my possessions and myself. You may think I was unsuccessful there too but again, not true. As I looked back at what happened and what was taken (and what was not taken) I see how God contained the incident. He allowed so much but no more. It could have been so much worse. My computer for instance, which is the lifeblood of my daily work, was not taken. There was no vandalism. My pets were not harmed and my insurance reimbursed most of the loss. Yes, I felt horribly invaded that someone was in my home looking through all my things. I wish it had not happened and I still kick myself sometimes but it did permanently knock out of me my lackadaisical indifference to security. As strong as the dream was, it had obviously not changed my daily living patterns. God was well aware of that. That leads me to another possibility: the dream got my attention but the burglary changed my behavior. How do I know that wasn’t God’s ultimate protection for me in the end? Perhaps the two things together worked to restrain a far worse incident that will never happen and that I won’t know about till eternity? Regardless, my dream will always remain a source of comfort to me. God still speaks to us in dreams. We feel his care and loving kindness when he visits us in our sleep. I feel that way about my October dream. Prayer over warning dreams can change an outcome or diminish an adverse impact. I believe that was definitely true in my case. But best of all, we have certainty that “God causes all things to work together for good to those who love God, to those who are called according to His purpose.” (Romans 8:28) You can count on it so dream on! ThanK’s for this sharing. It encourages me to keep on praying for clarity and also do what seems to be the message from God. Thanks a lot for this sharing, cause I am also a dreamer. God does indeed visit us in dreams! Some years ago, when shootings were uncommon, I dreamed that my husband was driving our car; my children and I were with him. Suddenly shots rang out and cars were going every which way. I woke up startled, heart pounding, totally confused. We were going on vacation the next day, so I thought I was just worried about the long drive and “triggered” the dream subconsciously. But I still had a nagging, uneasy feeling. My husband looked at me and asked “what’s wrong”? I told him about my dream. He laughed and said, “Well then, if I hear shots, I promise I’ll immediately pull off the road. You’re just nervous, you don’t like long trips”. I felt a little bit foolish. An hour into our trip, we heard “shots”… a tractor trailer just in front of us, was having a major blowout; several tires — rubber flying every which way. My husband, prepared by my dream, immediately braked, I hit the hazard lights & we pulled off on the shoulder. Several cars around us scattered — and the truck driver maintained control of his truck and safely pulled off to the side. The whole thing was like a slowmotion replay of my dream! We prayed a prayer of thanks and continued on our journey. I almost didn’t tell him about my dream, thinking I was being “silly” … I almost said “it’s nothing. You know I don’t like long trips”. That is a wonderful testimony. Thank you for sharing it. I hope it’s an encouragement to many. I was going through a very difficult time in my life, and I “escaped” into my computer for solace. Last night, I dreamed a man was trying to break the door of my church office where I slept. I saw two strong arms breaking the door but did not succeed. The dream ended ! Please help ! Thank you !! I do not know if this was a warning dream (like the one I had) or not, but I would consider that it is and pray accordingly. Don’t be afraid. Just begin to pray a hedge of protection around your church. Many times prayer can avert the bad outcome planned by the enemy. Also look for any area where you are lax regarding security and tighten things up. Ask the Lord to reveal any vulnerabilities. If He gave you the dream, He will help you be prepared.